Azure Clouds Pagoda (Biyun Si), named the Nunnery of the Azure Clouds, is situated in the eastern part of the Western Hills, just outside the north gate of Xiangshan Park. The temple buildings are on the gradually sloping hillside and, from the temple’s main gate at the foot of the hill to the highest point, rise almost 100 meters. 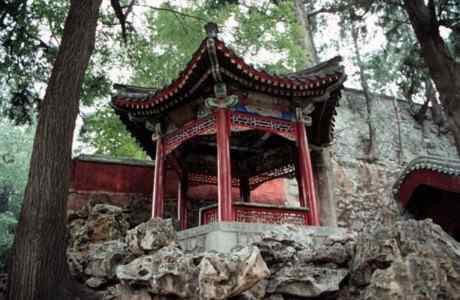 The Pagoda was first built in the early 14th century and was taken reconstruction during the Ming and Qing Dynasties. The interior buildings almost retain the style of the Ming Dynasty (1368 - 1644) completely. The most famous buildings inside the temple are the Sun Yat-sen Memorial Hall, the Five Hundred Arhats Hall and the Vajra Throne Tower. Since 1954, they have been renovated and painted anew, and Sun Yat-sen Memoriai Hall was rebuilt to pay tribute to this great pioneer of the Chinese revolution.